The wall-mounted display in the private equity firm's corporate headquarters provides visitors with an interactive experience on the firm's portfolio companies. Hartford Design also created a version of the presentation for a single iPad, for company representatives to use in meetings with clients. The complete design solution was strategically on target – creating a compelling and customizable presentation that provides each user with a unique experience. 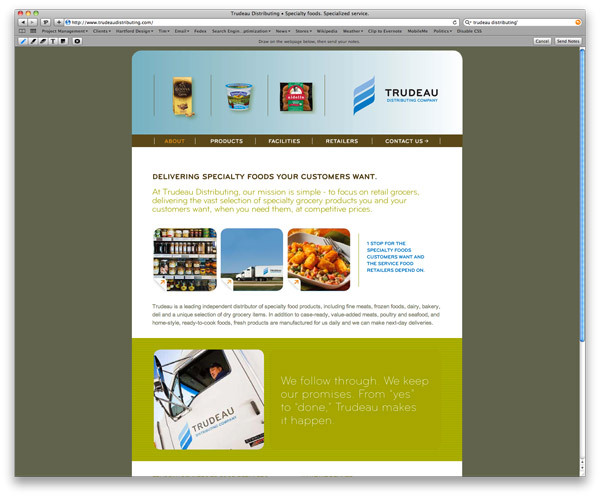 The website for Arbor Investments’ Trudeau Distributing was part of a rebranding effort for Trudeau. The effort included a new brand vision and voice as well as site design, development and search engine optimization. This Graphic Design USA annual competition - the American Web Design Awards - celebrates the power of well-designed websites and other online communications to attract audiences, generate engagement and response, and promote products, services and ideas. The idea resonates: entries nearly doubled this year. Still, only 100 design organizations were honored this year. The Society of Typographic Arts (STA) has selected Hartford Design to create the Call for Entries materials for Archive 06, the juried design competition, open to Chicago design professionals. Selected work will be featured in the STA’s permanent online archive. Since its inception in Chicago in 1927, the STA has been a vital participant in the Chicago design community, sponsoring seminars and conferences, and developing publications. Today, it serves as the driving force in Chicago design, presenting a diverse schedule of events, sponsoring the annual Archive competition, and hosting the Chicago Design Archive, a collection of significant work from the city.